Whether you’re starting your website from square one, or looking to update your current site, it’s important to keep best practices in mind that set you apart, while fitting the varying needs of your potential customers. 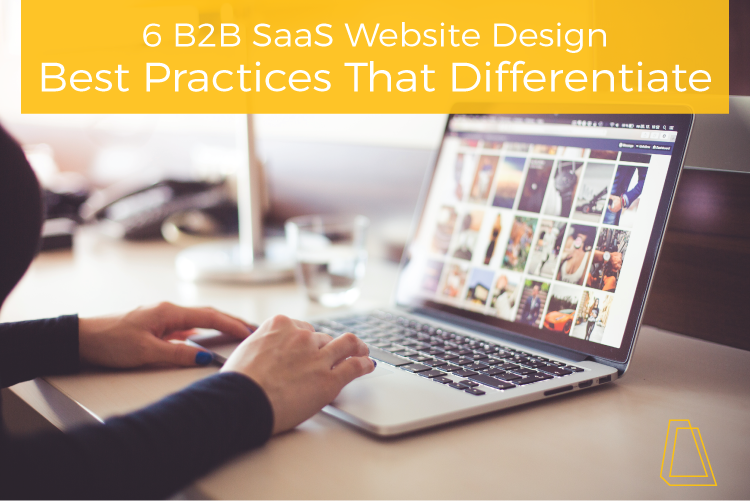 These B2B SaaS website design best practices will help you stand out in a crowded market, while optimizing your accessibility to customers. Consistency is key in any design, but when you’re trying to gain new customers or retain the interest of warm leads, you want your B2B SaaS website to have a consistent look and feel throughout. Keeping colors, imagery, white space and copy consistent makes scanning easy for the user and reduces confusion as they navigate across all pages. By keeping your website design easy to navigate and visually digestible, customers begin to learn more about you, leaving them with a positive impression about your services. 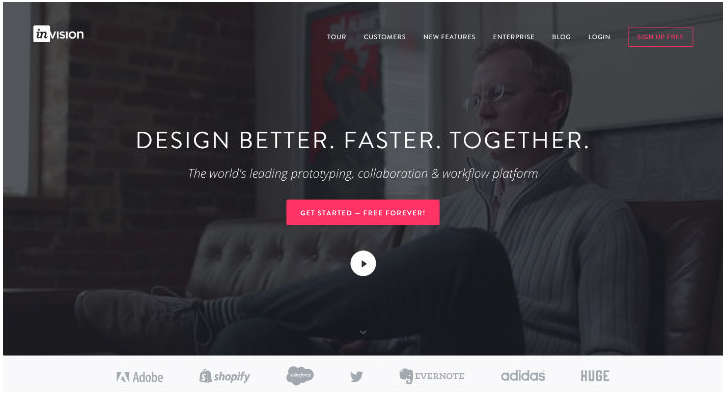 InVision does this well with their cohesive page design and visuals. Use accessibility to make your website effective for your users and confirm the steps they are taking to engage with your brand. Optimizing your navigation and maintaining consistency can help you prevent errors on your website. You can also make your site more user-friendly by preventing errors such as forms that navigate to the wrong page, or inconsistency between primary and secondary calls-to-action. Keep action items clearly defined by distinguishing your calls-to-action with large, clear buttons; your secondary call-to-action, such as “Cancel” or “Exit” should be formatted much simpler, to prevent the user from incorrectly navigating away from the next step. Include a pricing table on your site so visitors don’t have to reach out to you to inquire about the basics. Offer follow-up documentation after a user downloads material to engage the user deeper into your content offerings. Have a dedicated company overview page that explains what you can guarantee your customers and how they can work with you. Answer questions the users navigating to your site might have; make sure you answer them before they have to ask. Adding these things will make your users feel informed, but not overwhelmed. This is because minimalistic websites are appealing to the eye. When navigating to your site, users don’t want to be bogged down by over-stimulating images, moving graphics or auto-playing videos; they want to understand who you are as a company, and then decide (easily) where to navigate next to learn more. Keep typefaces simple (we love Proxima Nova) and keep your imagery cohesive. If you’re using all cartoon-based graphics because that speaks to who you are, go for it, but don’t mix and match styles—it will only confuse your prospects. 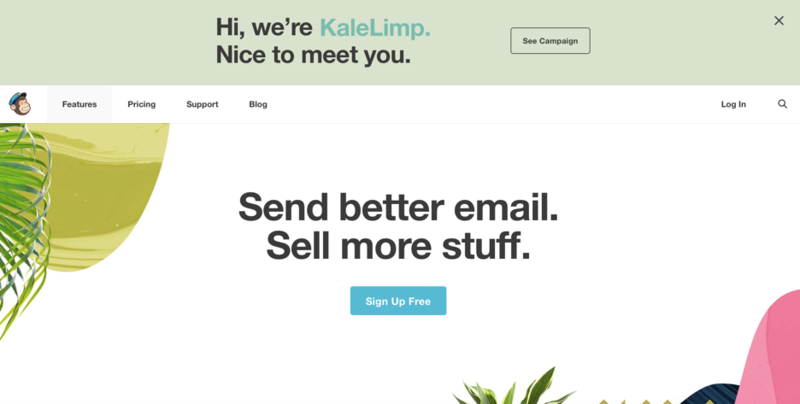 MailChimp does this successfully with it’s crisp white backgrounds and easily digestible content. Make sure your content is sharable—this is a small, but simple effort you can make when designing your site. If a user navigates to your website and finds something they love and want to share, that’s great. However, you need to make sure they can easily share via social media or email in one simple click. Include sharing and contact icons in the footer of each page on your site for easy access, and make sure sharing icons are on each of your blog posts to get your message out there. Keeping your B2B SaaS website accessible, clean and consistent, and making sure you’re offering great points of contact between you and the user, will not only make you stand out from the crowd, but will prove you a credible source. These handful of best practices are only a few ways to improve your online presence, but are foundational changes you can make to improve engagement. What are some of your best practices for bettering your website design? Share with me in the comments below.